Pokemon Stadium was the follow on from the Japanese only game of the same name. It was the first to be released internationally and came packed in with a Transfer Pak. This game, released in 1999 internationally, was the first chance gamers had to play with all 151 Pokémon of the Kanto region in 3D. 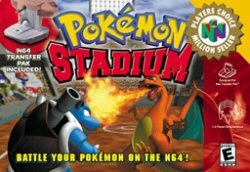 Pokémon Stadium allowed you to connect your Pokémon Green, Red, Blue and Yellow games to the Nintendo 64 and use the Pokémon in a variety of battle modes. These modes varied from Stadium modes where you battle through multiple trainers to win a cup and where you battle against the various gym leaders of Kanto. These battles can be done either with the Pokémon from your GameBoy games or with some of the many Rental Pokémon. Plus, while all Pokémon use updated versions of their cry in this game, if you use Pikachu from Yellow, it will say its name as per the anime. Outside of battling, the game provides organisational aspects of the game which allow you to organise the Pokémon in your boxes in the GameBoy game. In addition to this, you can also check through the Pokédex in full 3D and trade between two different game paks. Finally, it also includes a Kids' Club where 9 mini-games can be played on oyur own or with other players. Not only does the game give various battle challenges for you to use your Pokémon from the GameBoy games within, but it provides various Prizes. These prizes are of very rare Pokémon that you won't be able to get in your game without trading. Unlike its Japanese-only predecessor, Pokémon Stadium has a lower level of difficulty to start with. However, once you have defeated the game, it unlocks a new mode, Round 2, which features tougher trainers.